Deputy Defense Secretary Gordon England, who for a year has advocated that the US issue clear rules about detention and interrogation of terror suspects (see Summer 2005), calls a meeting of three dozen Pentagon officials, including the vice chief and top uniformed lawyer for each military branch. England wants to discuss a proposed new directive defining the US military’s detention policies. The secretaries of the Army, Navy, and Air Force are present, as are generals from each branch of service and a number of military lawyers, including Naval General Counsel Alberto Mora. The agenda is set by Matthew Waxman, the deputy assistant secretary for detainee affairs. Waxman says that the president’s general statement that detainees should be treated humanely “subject to military necessity” (see February 7, 2002) has left US military interrogators and others unsure about how to proceed with detainees. Waxman has proposed making it official Pentagon policy to treat detainees in accordance with Common Article III of the Geneva Conventions, which bars cruel, inhuman, and degrading treatment, as well as “outrages against human dignity.” The standard has already been in effect since the Geneva Conventions were first put into place over 50 years ago, and US military personnel are trained to follow it. In 2007, the Washington Post will observe, “That was exactly the language… that [Vice President] Cheney had spent three years expunging from US policy.” Mora will later recall of the meeting, “Every vice chief came out strongly in favor, as did every JAG,” or Judge Advocate General. Opposition - Every military officer supports the Waxman standard, but two civilians oppose it: Stephen Cambone, the undersecretary of defense for intelligence, and William Haynes, the Pentagon’s general counsel and a close associate of Cheney’s chief counsel, David Addington. Cambone and Haynes argue that the standard will limit the US’s “flexibility” in handling terror suspects, and it might expose administration officials to charges of war crimes. If Common Article III becomes the standard for treatment, then it might become a crime to violate it. War Crimes Questions - An exasperated Mora points out that whether the proposal is adopted or not, the Geneva Conventions are already solidly part of both US and international law. Any serious breach is in legal fact a war crime. Mora reads from a copy of the US War Crimes Act, which already forbids the violation of Common Article III. It is already the law, Mora emphasizes, and no one is free to ignore it. Waxman believes his opponents are isolated, and issues a draft of DOD Directive 2310, incorporating the Geneva-based language. Justice Department official Patrick Philbin testifies in a closed session of the House Intelligence Committee on the subject of interrogation tactics. Philbin testifies that each of the 24 approved interrogation tactics used by US personnel to interrogate terrorist suspects are “plainly lawful.” He notes that laws such as the Military Extraterritorial Jurisdiction Act and the Uniform Code of Military Justice define, to an extent, what is and is not torture, and prohibit excessive interrogation methods that might come under that rubric. He also notes that the US is a signatory to the Convention Against Torture (see October 21, 1994), which defines torture broadly as the intentional infliction of “severe pain or suffering” by anyone acting in an official capacity. He insists the US has done nothing to violate this treaty, nor the War Crimes Act, the Geneva Conventions, or Fifth and the Eighth Amendments to the US Constitution. 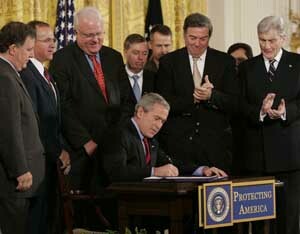 Although terrorist organizations such as al-Qaeda and “extragovernmental” organizations such as the Taliban do not fall under the protection of the Geneva Conventions, Philbin argues that the US continues to follow its guidelines in its treatment of prisoners from those groups “to the extent consistent with military necessity…” [House Intelligence Committee, 7/14/2007 ] However, in 2004, a classified report by the CIA’s Inspector General concluded that some of the interrogation techniques used by the CIA probably did violate the Convention Against Torture (see May 7, 2004).